To find out what the most popular sizes of breast implants used in breast augmentation are, we did an analysis of the last 125 cases of breast augmentation procedures performed by Dr. Ricardo Rodriguez in our surgery center located in Baltimore, Maryland. So what styles and sizes of implants were most popular? Glad you asked! The comparison of silicone implants to saline implants was a landslide win for silicone. After more than a decade of breast implant hysteria in the 1990’s, silicone implants are solidly back as king of the mountain. Approximately 80% of our patients choose silicone implants over saline implants. The next criteria we compared was moderate profile implants vs. high profile implants. Each size of silicone implants can be either moderate profile or high profile. High profile implants give more projection and have a smaller base diameter. The implant also has a slight oval shape compared to the moderate style. Moderate profile implants do not give as much fullness and are completely circular, which means they occupy more space horizontally on the chest wall compared to high profile implants. High profile implants trounced moderate profile implants by a 6 to 1 margin. 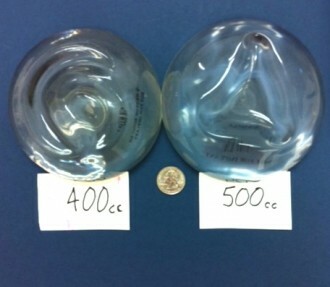 Breast implants come in a wide range of sizes which go from 200 cc to 800 cc. They are generally sized in increments of 25 cc, which is about the size of a kitchen serving spoon. Since 1 cc= 1 ml, you can use a kitchen measuring cup to get an estimate of size. Fill the cup with water up to the number of ml’s (cc’s) and pour the water into a plastic baggie. Voila! You have a quick rough estimate of your new implant size. However, to get the best idea of implant size, you should ask your plastic surgeon for the sample size. Here at CosmeticSurg we let all of our breast augmentation patients try on every size that is manufactured. The photo above is the actual display cabinet of various implant sizes. During consultation, patients can try on as many implant sizes as needed to help them make the best selection. Our most popular implant is a high profile, 400 cc, silicone implant. Looking back at breast implant choices over our latest 125 breast augmentation procedures, it’s clear that our most popular breast implant is a high profile, 400 cc, silicone implant. I have done them, but a lot depends on the individual, if they have had an augmentation before, how much the patients skin and muscle can tolerate the stretch etc. Leeza wrote it, she’s great! Excellent little article! Really enjoyed reading it. Proper implant sizing is essential when considering breast augmentation. Most think that “bigger is better” however that’s not always the case. If you go too big you can run the risk of looking heavier than you actually are.